I’ve had some really great comments and feedback on my post about Show Quilting from my How to Make Quilting Your Business series. Many of you wanted to know how you go about finding quilt shows to enter and what’s involved in submitting a quilt. I thought I’d share a little bit of what I’ve learned over the years in the hopes that it will be helpful to some of you! 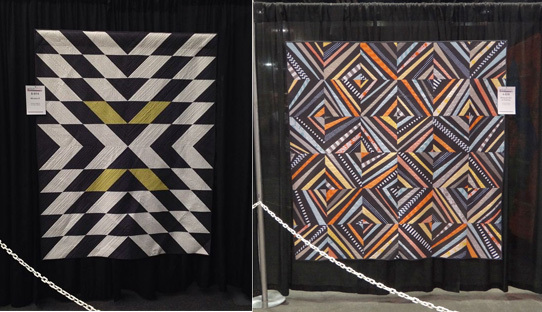 Although no stranger to local shows, the first time I ever entered a national show was QuiltCon in 2013 with my first modern quilt – Charming Chevrons. What an experience! 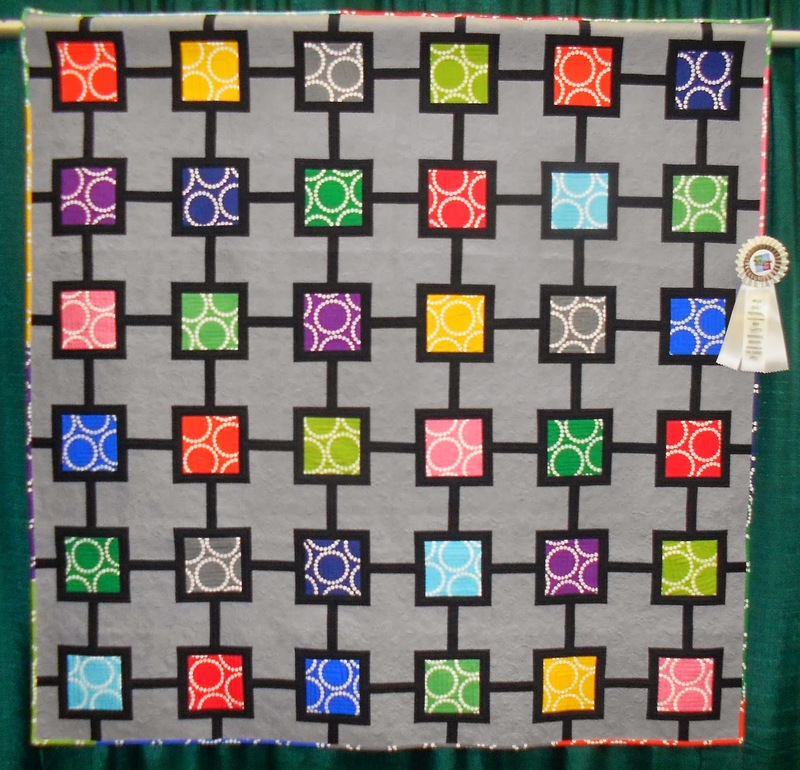 There are literally hundreds of different quilt shows, contests and events in which you can exhibit your quilts, both locally and nationally (or internationally, too). I keep an updated list about all of the shows I know about, along with notes about where they are located and what the entry deadlines are. Whenever I hear about a new show, I add it to the list. My friend Leanne from She Can Quilt has put together a wonderful spreadsheet of some upcoming shows on her website. Be sure to check it out here! My first ribbon from a national show was at MQX with String of Pearls – what a thrill! The best place to start finding out about shows is at the local level. Inquire with your local guild (modern, art, traditional, what-have-you). Ask them if they put on a show, or if they know anyone locally who does. Even if your town doesn’t host an annual show, there’s probably a nearby community that does. Local shows are also great for getting your kids involved with quilting. 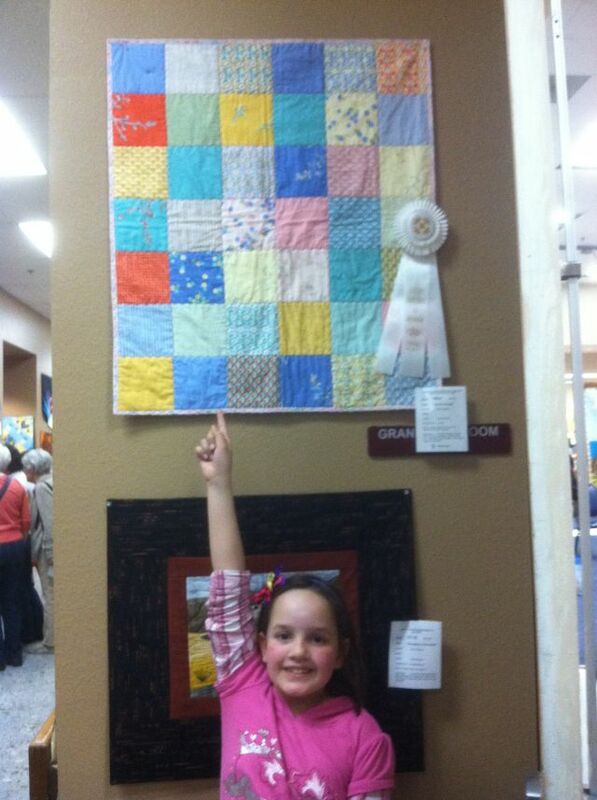 My daughter was thrilled when her first quilt won a ribbon in the kids’ category at my local guild’s show. You can also try your local city or county fair. They usually have a quilt division and this is a great place to get your feet wet, especially if it’s your first time entering. I’ve found the best place to find out about larger national/international shows is through the numerous quilting magazines I read. (Don’t worry, I’ll write up a separate post on my favorite magazines sometime!) Larger venues spend a lot of time and resources to advertise their shows. Go grab any established quilting magazine you can think of and I bet you’ll see ad for one of the larger shows in there somewhere. Once I jot down the information, I’ll go to that show’s website and sign up for their newsletter. Then I’ll get reminders and updates about future shows, too. Don’t be shy about putting the same quilt in multiple shows. 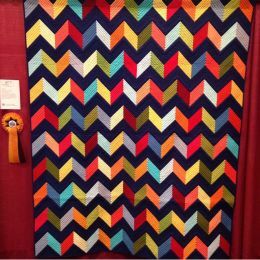 So far Colorful Chevrons has earned an award at both shows I entered – AQS Paducah and MQX Midwest. Social media is another great place to discover shows to enter. I first heard about QuiltCon back 2013 not from the Modern Quilt Guild, but rather from someone who mentioned it somewhere on their blog. Speaking of social media, there are tons of online shows and contests as well. The biggest one I can think of is the Blogger’s Quilt Festival. It’s hosted by Amy Ellis and is open to anyone who blogs. Moreover, just google “quilt shows” and you will find a plethora of venues to explore! 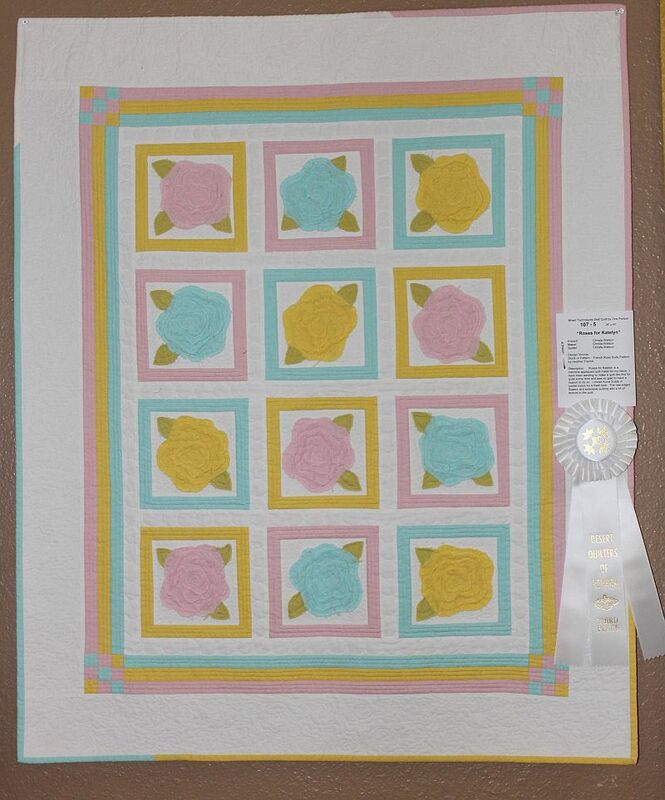 Although my sister’s baby quilt didn’t win anything in the blogger’s quilt festival, I also put it in the local show where it earned a 3rd place ribbon. That was fun! Quilt shows can either be juried or non-juried. Juried means you usually submit an image of the quilt you are wanting to enter into a particular show. Each show will specify if the quilt must be finished or not before the jury process. A panel of jurors will look at all of the submissions and decide which ones they would like to accept for judging into their show. Once you receive notification that your quilt has been “juried-in” it’s up to you to ship the quilt to the venue at your expense by the specified date. In my experience, most local shows are not juried and many will usually accept all of the quilts that are entered, up to a maximum limit depending on space constraints. In these instances, you usually just have to fill out a form describing the quilt and select the category, then be sure to have the quilt finished by the specified entry date. There are a few national shows that are not juried (such as NQA and HMQS), and each particular show will have all of the rules spelled out on their websites. You’ll usually need to attach a 4″ wide hanging sleeve to the back of the quilt, along with a label indicating your complete name and address. Because I usually enter a lot of my quilts, I’ve started making that part of my quilt-making process once I finish a quilt. Click here for a tutorial on how to make a hanging sleeve. I’m a big advocate of showing off your work, whether you feel like it’s “ribbon-worthy” or not. Just think of the pleasure you’ll give someone who goes to a particular show to be inspired by all of the beautiful quilts. Although Modern X and Spiraling Out of Control haven’t won any national awards, they will be exhibited publicly over the coming months and that’s just as much fun! Some shows allow you to choose for your quilt to be on display only which means it won’t be judged. However, if it is judged, don’t take the comments as criticism, but rather as a critique of how to do better. 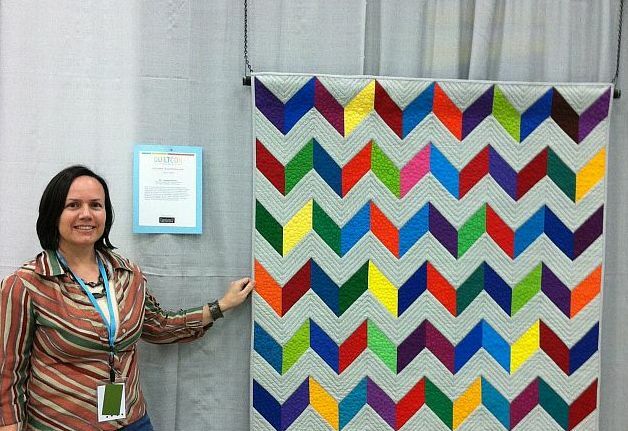 I’ve worked behind the scenes in the judging room at my local quilt show and it’s been a wonderful learning experience. The nationally certified judges they hire always go out of their way to say something positive about your quilt! 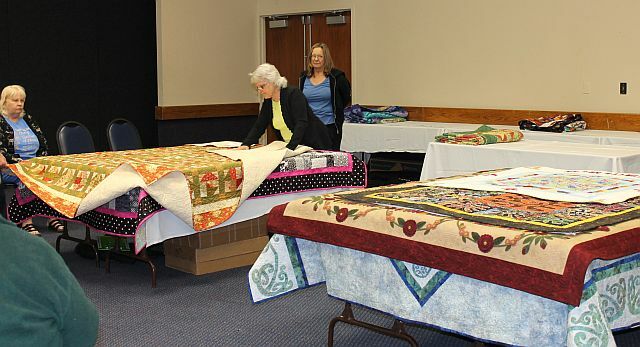 Quilt show judging on a local level – quilts are stacked in order on a table so the judge can evaluate them one by one while scribes and quilt handlers stand by to help. So what do you think – with the upcoming quilt show season – are you in? Christa, I am very curious about the juried competitions, which I have never entered. Do they have you submit just one photo of the whole quilt or close-ups as well? Have you encountered rules about using patterns designed by others? Or fabric lines/commercial fabric? Thanks as always for your great posts. They usually ask for two photos – an overall shot and a detailed shot. Usually you can enter someone else’s design as long as you have design permission, but not all shows require that. The usually courtesy is to state which pattern was used in the details of the quilt section. Good luck with it! Visiting Japan last year for a holiday, I entered a quilt, on a whim, for display at the Yokahama International Quilt Exp. which was being held at the time. I have never shown any of my quilts overseas before. What a thrill to see it hanging at such a great show. It was the only quilt from Australia, which also made it seem very special to me. Couldn’t wipe the smile off my face my husband said. It is now hanging at a show in Brisbane. Christa, do you feel that shows help you as a professional quilter, or do you just do them for fun? It’s a little bit of both. I do them mainly for fun but it certainly helps get my name out there in public, whether or not I receive any recognition for my quilts. And it gives me an excuse to make a pretty quilt! I’ve never thought about entering any of my work, but I may have to reconsider. Thanks for the hints. Thanks for the info. I’ve not entered any shows….seems like it’s a challenge just to complete the clients’ quilts with my needed gift quilts, too. Displaying my finishes at my local guild’s events has been sufficient thus far. Thanks for a great post. I haven’t entered any quilts in shows yet but I will at some point soon. I wish I had has this months ago, I entered 3 on a whim not knowing what I was doing. I am proud to say all 3 won ribbons, can wait to get them back to see what the judges said I needed to do to improve. I am. To a competitive quilter…..so I thought. This was so much fun, I think I have the bug! thank you for the information on showing quilts. I have entered my first show (November, eek!) and I appreciated the link to Jacquie’s tutorial for a hanging sleeve. I am fairly new to quilting and decided it is now or never so I have entered my triangle quilt which I blogged about here. Thank you for all your encouragement. I get so much inspiration from the blogs I follow.